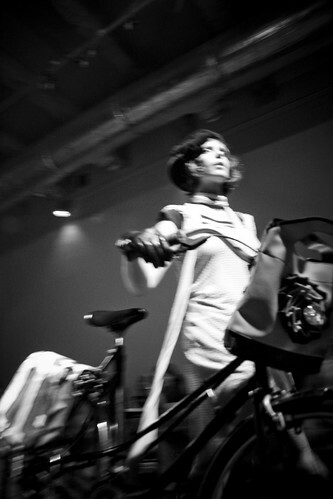 A couple of days ago I had the pleasure of attending a Cycle Chic fashion show with my friends from Hungary Cycle Chic. I was in Budapest attending a conference where I lectured about Marketing Bicycle Culture and then there was a massive critical mass bike ride and I wrapped up my trip to the Hungarian capital with this fashion show and party. What a cracking time. 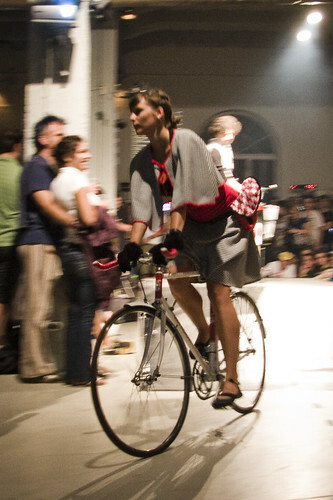 The people at Hungarian Cycle Chic are a dedicated team doing everything they can to promote cycling positively and this fashion show is really only the tip of the iceberg. On Monday I attended a meeting they had about their project and it was brilliant to see how they approached it with not only passion and drive but the all-important sociology of how to encourage people to cycle more and how to mainstream urban cycling. It was a packed house for the fashion show. Here's the stylist for the event on the left - amazing job she did - and here's a fashion writer for a online mag called Pink.hu. And here's some schmuck from Copenhagen with Henritte from Hungarian Cycle Chic. I was busy chatting and drinking red wine and filming as well as trying to shoot stills, so my photos weren't the main focus. But I like this one. See the whole set of photos from the event in a slideshow right here. 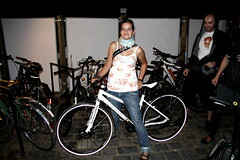 And be sure to check out Hungarian Cycle Chic's website. They've uploaded photos from the event which are brilliant. thank you so much, Mikael! 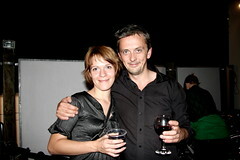 i'll translate it for the morning post, we are so happy, that you had a good time in Budapest! You're The Original Cycle Sheikh! Unfortunately I missed the fashion show. But I made sure that I pay the respective shop a short visit before I leave the city ;-). Although I didn't really understand what they meant by "bike fashion", I think now I know (just comfy and fashionable clothes with prints of bikes and cyclists).